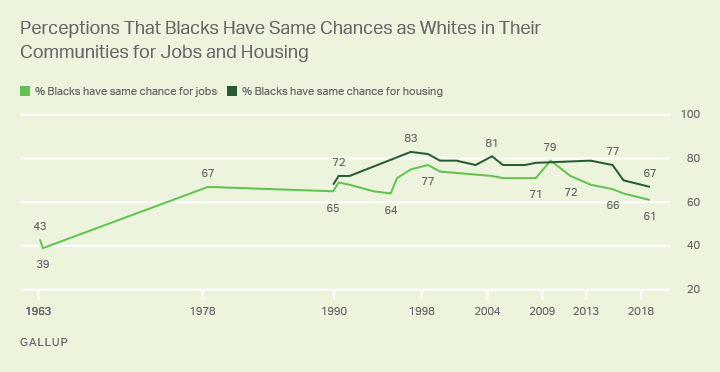 WASHINGTON, D.C. -- Majorities of Americans continue to believe blacks have the same opportunity as whites to get any job for which they are qualified, as well as to get any housing they can afford, but the percentages holding these views are the lowest Gallup has recorded in decades. Sixty-one percent of U.S. adults now say that blacks in their community have the same chance as whites to get any job for which they are qualified, the lowest since before Dr. Martin Luther King Jr.'s August 1963 "I Have a Dream" speech when fewer than half perceived this. 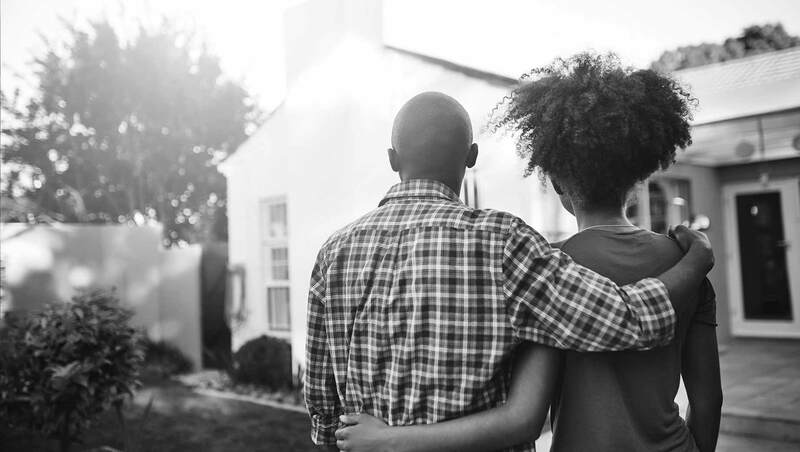 Sixty-seven percent believe blacks in their community have the same chance as whites to get any housing they can afford, the lowest by one point in this trend originating in 1989. The figure was 68% in that initial reading. These findings are based on a Gallup poll conducted Nov. 19-Dec. 22, 2018, with over 6,500 U.S. adults, including oversamples of blacks and Hispanics. Today's low point in these perceptions contrasts with October 2009, the first year of Barack Obama's presidency when hopes may have been high for black equality, and 1998, a year after then President Bill Clinton had launched his "One America" initiative to foster a national dialogue on race. In each of these times, positive perceptions about black opportunity exceeded 77% on both measures. Whites and blacks have long disagreed about racial equality in the workforce and housing, with majorities of whites believing blacks have the same chances as whites, and majorities of blacks saying they do not. The gap persists in the latest data, although the perception of equality has declined among both groups, falling to the lowest point since the 1960s. In the 2018 poll, 67% of whites and 30% of blacks expressed the view that blacks have the same chance as whites in their community to get any kind of job for which they are qualified. 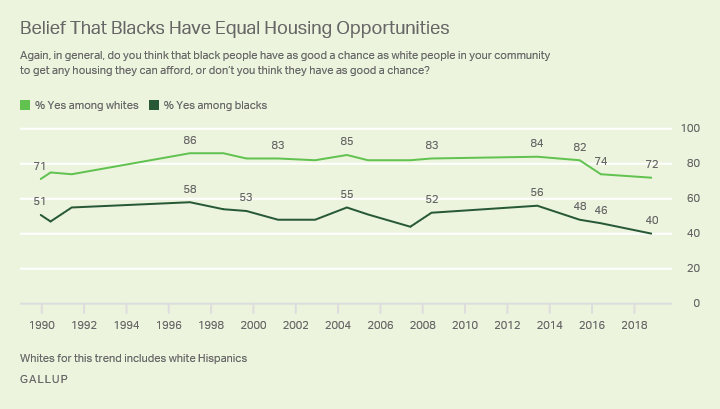 Both groups in the latest poll were just slightly more likely to perceive equality for blacks in housing, with 72% of whites and 40% of blacks saying that blacks have the same opportunity as whites to buy what they can afford. Notably, it is not just whites who possess a far rosier outlook than blacks about racial equity for blacks, but also Hispanics. In fact, Hispanics' views are nearly identical to those of whites on both questions: 64% of Hispanics see equality for blacks in obtaining employment and 67% see equality in housing. As great as the black-white and black-Hispanic differences are in these views, partisan differences are even greater. Roughly nine in 10 Republicans believe blacks have equal opportunity as whites when seeking jobs and housing while fewer than half of Democrats agree. Notably, within Democrats, racial differences are much more muted than they are nationally. Less than half of white Democrats (39%) as well as black Democrats (22%) believe blacks have as good a chance as whites in the job market. Hispanic Democrats remain apart, however, with the slight majority (52%) saying blacks have the same chance as whites. The racial pattern is similar with respect to Democrats' perceptions about racial fairness in obtaining housing. On what would have been Martin Luther King Jr.'s 90th birthday, recent Gallup polling finds perceptions of equality for blacks continuing a downward slide. Fewer Americans now compared with any time in the past three decades believe blacks are on par with whites in obtaining jobs and housing. Public perceptions about racial equality were fairly positive from the 1980s through the start of Barack Obama's presidency in 2009, but have grown less so since. Recent controversy over police treatment of young black men, and the resulting emergence of the "blacks lives matter" movement, is likely one factor sparking greater sensitivity to discrimination against blacks. Although it's been more than a half century since passage of the 1964 Civil Rights Act which banned discrimination in employment on the basis of race, gender, religion or national origin, the nation is still divided on the status of blacks in society. Whites and Hispanics are relatively positive about opportunities for blacks, while most blacks continue to believe race is an obstacle. Results for this Gallup poll are based on telephone interviews conducted Nov. 19-Dec. 22, 2018, on the Gallup U.S. Poll, with a random sample of 6,502 adults, aged 18 and older, living in all 50 U.S. states and the District of Columbia. For results based on the total sample of national adults, the margin of sampling error is ±2 percentage points at the 95% confidence level. For results based on the sample of – 4,578 – non-Hispanic whites, the margin of error is ±2 percentage points at the 95% confidence level. For results based on the sample of – 701 – non-Hispanic blacks, the margin of error is ±5 percentage points at the 95% confidence level. For results based on the sample of – 760 –Hispanics, the margin of error is ±5 percentage points at the 95% confidence level. All reported margins of sampling error include computed design effects for weighting. Interviews are conducted with respondents on landline telephones and cellular phones, with interviews conducted in Spanish for respondents who are primarily Spanish-speaking. Each sample of national adults includes a minimum quota of 70% cellphone respondents and 30% landline respondents, with additional minimum quotas by time zone within region. Landline and cellular telephone numbers are selected using random-digit-dial methods. Samples are weighted to correct for unequal selection probability, non-response, and double coverage of landline and cell users in the two sampling frames. They are also weighted to match the national demographics of gender, age, race, Hispanic ethnicity, education, region, population density, and phone status (cell phone-only/landline only/both, cell phone mostly). Most Americans believe blacks have the same chance as whites to get a job, a good education and any housing they can afford, but fewer hold these views than at any point in the last two decades.